Stop Drinking Wimpy Smoothies, Make A Super Shake Instead! We’ve all been there before. That moment when you have an urgent event to attend and you need to eat something quickly. You open your fridge and see nothing tasty. Are you sure that’s the right choice? We both know what normally happens after eating fast food. It tastes great going down but shortly after your mind and body start to feel sluggish. How would you like another option? A simple five-minute solution to your time crunched dilemma? I would like to talk to you about the awesome invention of the Super Shake! Over the years there’s been many incarnations of trying to get people to drink rather than eat their calories. The first and most successful was Slim Fast. In grocery stores and at local juice/café type restaurants, commercialized smoothies have now become the trend. 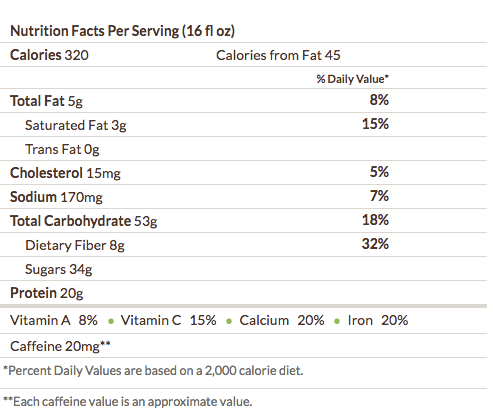 The problem with Slim Fast and most smoothie drinks is that the liquid substances are not really healthy. When you actually look at the ingredients, you will see that they typically contain excess sweeteners, unhealthy fats and unnatural ingredients to fool you into thinking they’re healthy. Water, Calcium Caseinate, Milk Protein Concentrate, Canola Oil, Cocoa (processed With Alkali),potassium Phosphate, Cellulose Gel, Mono And Diglycerides, Maltodextrin, Glycerin, Potassium Citrate, Salt, Soy Lecithin, Cellulose Gum, Natural And Artificial Flavor, Sucralose (a Nonnutritive Sweetener), Carrageenan, Sodium Citrate, Citric Acid. Magnesium Phosphate, Sodium Ascorbate, Calcium Phosphate, Vitamin E Acetate, Zinc Gluconate, Ferric Orthophosphate, Niacinamide, Calcium Pantothenate, Manganese Sulfate, Vitamin A Palmitate, Pyridoxine Hydrochloride, Riboflavin, Thiamin Mononitrate, Folic Acid, Chromium Chloride, Biotin, Sodium Molybdate, Potassium Iodide, Phytonadione (vitamin K1), Sodium Selenite, Cyanocobalamin (vitamin B12), Cholecalciferol (vitamin D3). Sweetened With A Nonnutritive Sweetener. Contains Milk And Soy. Juice/Café type restaurants like Starbucks seem like the perfect option for those with limited time but you can do even better (and save lots of money) when you create your own Super Shakes. What Exactly is A Super Shake? Protein is the most important nutrient to get right when it comes to losing fat or gaining muscle. 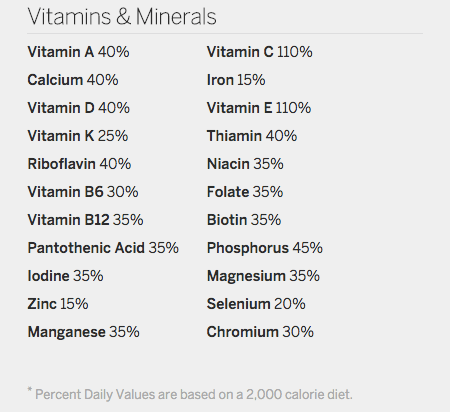 This is the one micronutrient that you definitely want to be sure your shake contains a decent amount of. Too many shakes skimp out on this. If your goal is to make your body look good, you’re going to need protein. A super shake does not rely solely on protein. Just consuming protein powders by itself is not really good for your GI tract. You’re going to want one or more of the following ingredients to turn that average protein shake into a Super Shake. Most juice smoothie places tend to have lots of fruity shakes. 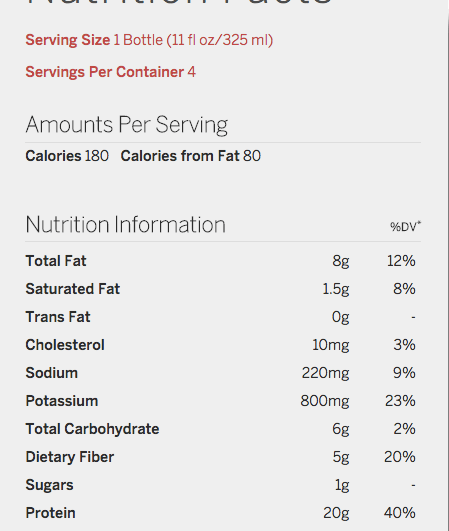 The problem is that the majority of those shakes add additional sugar instead of relying only on the fruit for sweetness. My super shakes usually only use fruit as the sweetener. The secret weapon to Super Shakes is vegetables! If you hate eating your vegetables, a Super Shake is an easy way to sneak them into your diet without noticing. You get tons of vitamins that you typically are missing out on when you add these to your shake. With all the ingredients you’re going to put into a Super Shake, you normally do not taste the vegetables (except carrots because they are sweet). If you don’t have any fruits and/or veggies, you still need to get your vitamins in with this meal. My favorite option is to get some type of Greens supplement like Greens+. Some Greens supplements come pre-flavored which is great because the default source tastes just like grass. Blend the Greens supplement in with your shake or just take a straight up shot. If you have a juicer, that’s always an option as well for your fruit and vegetables. Personally I’m a bigger fan of adding the whole fruit/vegetable to your shake so you can get ALL of the natural goodness from the items. Your shake is a complete meal so you want the best nutrient possible in it. Only time I may skip adding fats to the shake is if it is an immediate post-workout drink. Otherwise, it’s best to add some healthy fats to your shakes. Depending on how many calories you’re eating you can use water or go with some more exciting options. Also don’t forget the ice. If it’s a frozen treat you’re after add more. To make these Super Shakes you should make sure you have a solid blender. I’ve used standard blenders as well as magic blender options. It all comes down to your lifestyle choice. The bigger blenders typically last longer than the smaller travel size ones. A Super Shake is the ultimate fast food replacer. The time it takes you to go to a drive thru, place your order, and get your food, you could already have a perfect Super Shake. If you’re a morning iced coffee/Frappuccino person, why not make your own iced coffee super shake? Those moments when you are in a pinch, all you need to do is keep a few ingredients in your pantry, fridge and/or freezer and you my friend got a great digestible meal in front of you! Simple Green Smoothies have great recipes. My only recommendation to their smoothies would be that you add more protein to them so they could become Super Shakes!